This is the second in a series of posts on what to do during neurological emergencies. Today, seizures. On the grand scale of scary things, watching someone go through a full-blown, tonic-clonic seizure has got to be near the top. That said, even though seizures can kill, they’re less immediately life-threatening than a stroke (see this post for stroke first aid). Also, despite how scary seizures look, seizure first aid is surprisingly easy. It’s more about what not to do than what to do. A seizure happens when there’s too much electrical activity in the brain. Specifically, too much of a type of activity that neuroscientists call excitatory. The total electrical activity in your brain is a sum of excitatory messages (“do this!”) and inhibitory messages (“don’t do this!”). Although 100% of your brain is always active (not 10%, see this post), most of that activity is inhibitory. This is because your brain spends a lot of its time filtering out unnecessary information or actions. But if your brain flips from mostly inhibition to mostly excitation, the result is a seizure. This image shows excitatory electrical activity (red) spreading through the brain of someone having a seizure. This is if you were looking down on the brain from the top. Starting from the upper left and moving right, each image is a few seconds apart. 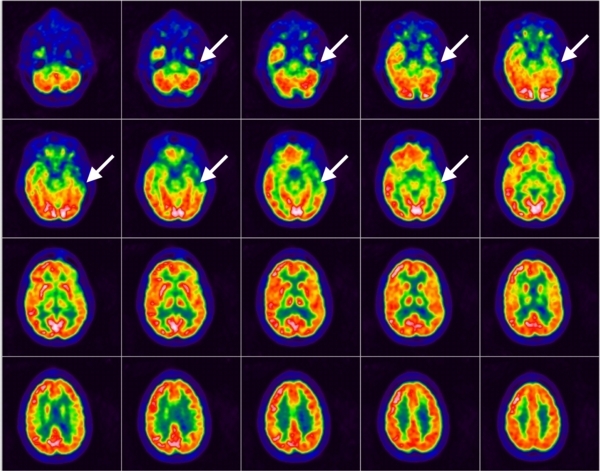 From http://pet.radiology.uiowa.edu/webpage/research/casestudies/epilepsy%20test. Everyone. I’m not saying this to scare you. It’s extremely unlikely that you’re going to have a seizure while walking down the street tomorrow afternoon. My point is that, given the right situation (like a high fever or exposure to certain toxic chemicals), anyone can have a seizure. It’s especially likely in people who have epilepsy, which is a brain disorder where people have repeated seizures. There’s two types of seizures, absence and tonic-clonic. I’ll talk about them separately. It’s in the name. Someone having an absence seizure looks absent. They space out. You might not even know they’re having a seizure, unless you try and talk to them and they don’t respond. Some people can have hundreds of them in a day, which is problematic to say the least, but they’re less dangerous than tonic-clonic seizures. They’re brief, usually lasting only about 20 seconds. These used to be called "petit mal." Also known as "grand mal," if you want to be outdated and so last century. This is what you think of when you think of seizures. Violent uncontrolled muscle contractions of the entire body, lasting for several minutes. Because tonic-clonic seizures are both dangerous and easy to recognize, they’re the ones I’ll focus on for the rest of the post. DO remove anything that they might hit their head on. People who die during seizures don’t always die because of the seizure itself. Sometimes, it’s because they hit their head. I know this too well. I lost a friend this way. I’m telling you that to point out how important it is to remove anything that a person might hit their head on, like furniture. If you can’t move the furniture because it’s, you know, furniture and therefore heavy, grab pillows and blankets and place them around the person. You can also use pillows as shields – put them against the furniture, so that if the person does hit the furniture, the impact isn’t as hard. DO NOT try to restrain the person. The person is going to be having very violent muscular contractions, and I mean violent. If you try to restrain them, they’ll probably punch or kick you, and that just adds a whole level of un-fun to an already un-fun situation. (A person is technically unconscious during a seizure. They did not mean to whack you. It was an accident.) Protect yourself. Remember, the pillows will keep the person safe. DO NOT put ANYTHING in their mouth.There’s a weird rumor that’s been going around for years, that you have to put something in the mouth of a seizing person, otherwise they’ll swallow their tongue and choke on it. It’s all over pop culture, and it’s wrong. So very wrong. I’m gonna bust this myth right now. It is physically impossible to swallow your own tongue. It can’t happen. Not a chance. EVER. (If you don't believe me, open your mouth and lift up your tongue. See the membrane running from the base of your tongue to your lower jaw? That's called the frenulum, and it's what stops you from swallowing your tongue.) But what’s going to happen if you put something in the mouth of a seizing person – someone who’s having extremely strong, violent muscle contractions, including the muscles of the jaw? Stick a wooden stick in there (the “recommended” option), and they’ll bite it, possibly breaking their jaw and swallowing splinters. Stick your finger in there (also “recommended”), and they’ll bite you, which is going to hurt. So unless you think a seizure isn’t bad enough and more problems would be a good thing, NEVER EVER stick something in the mouth of a seizing person. DO NOT leave the person alone. You need to keep both eyes on them. Make sure they keep breathing. Remember everything that happens, so that you can tell the paramedics. That’s it. Move stuff, grab some pillows, arrange them, and then sit back and pay attention. Resist the urge to interfere – you could make the situation a lot worse. WHEN DO I CALL THE PARAMEDICS? If the person stops breathing. Grab that phone and dial! Now! If the person does not have a history of seizures. If an epileptic has a seizure, you don’t need to rush for the phone. But if you don’t know if the person is epileptic, or if you know they’ve never had a seizure before, it’s time to call. If the seizure lasts more than 10 minutes. If a seizure lasts this long, you’re in emergency territory. They need to go to the hospital. 911 time. If the person hits their head on the furniture. This isn’t what’s officially taught in first aid courses, but I’m making a call and adding it in. Personal history, and all. What this adds up to is, if an epileptic has a four minute seizure, you don’t need to call the paramedics. Otherwise, call. If in doubt, remember that paramedics would rather be called and not needed, than needed and not called. WHAT DO I DO AFTER THE SEIZURE IS OVER? Seizures usually end on their own after 3-4 minutes. When it’s done, check to make sure the person is breathing, awake, and aware. They’ll probably be drowsy and confused and have a banger of a headache. They might even be sleeping. Roll them on their side if you can, then stick around until they wake up. Don’t leave them alone until you’re sure they’re okay. If you called the paramedics, stick around at least until they arrive. Sometimes people come out of seizures feeling embarrassed. If they want privacy, be considerate and give it to them. Like I said, seizures are scary to watch. But keep cool, keep an eye on the person, and protect their head. Keep that phone handy, and call 911 if necessary. Follow these instructions, and you could save a life. Really! This Blog is very informative for us which contain lot of information about occupational health and safety products. I like this post. Two types of seizures? No. There are several different kinds. Atonic, clonic, tonic clonic, absence, simple partial, complex partial, myoclonic among others. Also, if a tonic clonic continues for longer than *five* minutes, call the paramedics, not ten. And please turn the person on their side rather than simply watching to make sure they're breathing, (prevents choking.) If a partial seizure continues for more than half an hour, do the same.